is the movie that the former Cashier Du Cinema critic and legendary French director Francois Truffaut is universally associated with. 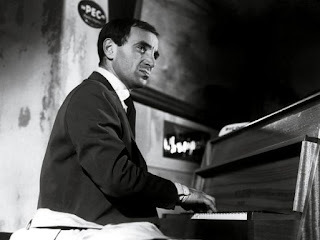 However it was his second feature Shoot the Piano Player that not only formed one of the most defining movies of the French Nouvelle Vague movement, but is also considered by many as his greatest achievement. Arguably Truffaut’s most audacious and experimental work, it was his undying homage to Film Noir and Gangster movies, as well as, to a lesser degree, B-movies, musicals and farcical comedies – a pastiche to American genre movies in general. Loosely based on a pulp thriller, the movie comprises of a free-flowing blend of iconoclastic New Wave techniques like jump cuts, unrelated montages, ad-libs, improvised screenplay, dialogues that at times have no bearing with the scene under consideration, etc. The story of a washed out divorced piano player, trying to escape his past, and forced to be on the run by shady thugs, is fairly straightforward. But the memorable dialogues, brilliant comical interludes, moments of heart-touching delight and humanism, self parody, and marvelous turns by the leads, especially the actor (a famous singer in real life) who played the role of the chief protagonist, make this a truly exceptional work of cinematic achievement. The movie counts among its famous proteges Tarantino's Reservoir Dogs and Pulp Fiction. Find a larger review of the movie written by me here. Yes, correctly said. Comical interludes like the thug's promise and Eduard's tongue-tiedness are so amusingly charming. Exactly. In fact the scene where the kidnappers and the hostages discuss on something as out-of-place and irrelevant as women and flings was certainly a source of inspiration for Tarantino - the opening scenes of both Reservoir Dogs and Pulp Fiction where gangsters and killers discuss on things as inane and even ludicrous like the necessity of giving tips and the metric system of France, respectively.